- DVD/2-CD set of the program, Neil Diamond: Hot August Night III Live from the Greek Theater - includes all 38 songs fromt the program on both CD and DVD. 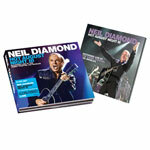 - Booklet - Neil Diamond: Hot August Night III Live from the Greek Theater - EXCLUSIVE TO PBS! This 64-page photo book features many photographic rememberances from the Greek Theater performance featured in the program, plus additional photos of the performers and some vintage photos. 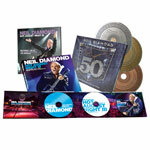 - 3-CD Set - Neil Diamond 30th Anniversary Collection - 50 songs that cover the Grammy-winning artist's incredible 50-year career. This selection was handpicked by Neil Diamond himself and includes all your favorites! 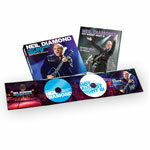 - BLU-RAY/2-CD set of the program, Neil Diamond: Hot August Night III Live from the Greek Theater - includes all 38 songs fromt the program on both CD and BLU-RAY.